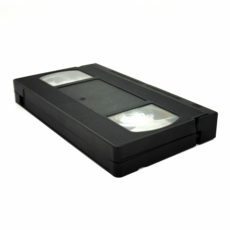 The Video Home System (VHS) is a standard for consumer-level analogue video recording on tape cassettes. Developed by Victor Company of Japan (JVC) in the early 1970s, it was released in Japan in late 1976 and in the UK and USA in early 1977. All of these recording lengths of tape were able to record double the minutes shown if your VHS player had the ability to record in LP (Long Play) Mode. If your tape is an E 180 (3 Hours) but was recorded using LP Mode, then a full tape would run for 6 hours. 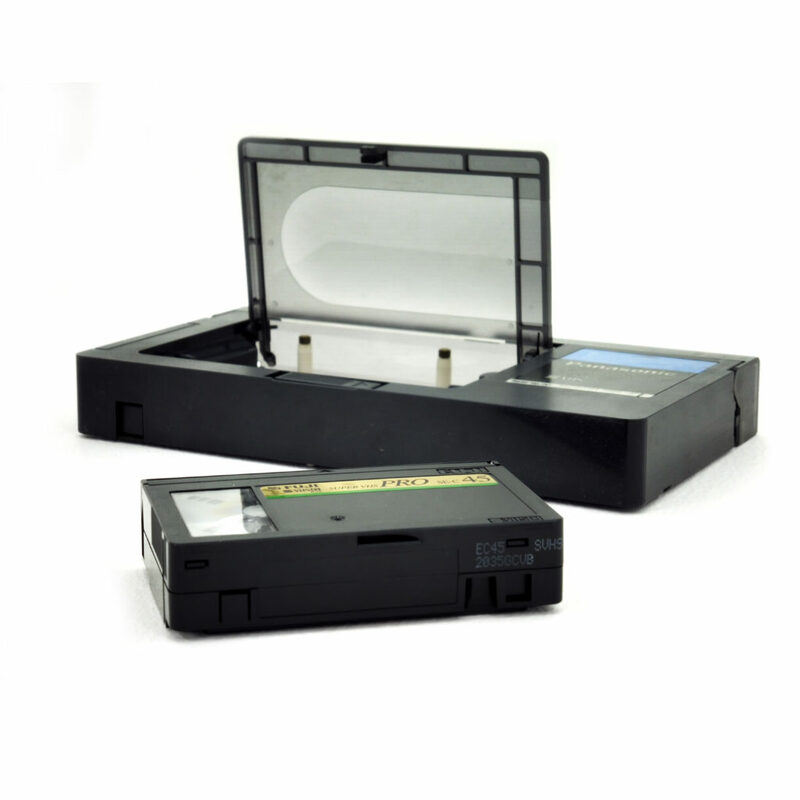 If we receive a tape that is over 3 hours running time we may split the transfer on to a two DVD set to provide the best quality transfer and this would be charged for accordingly. 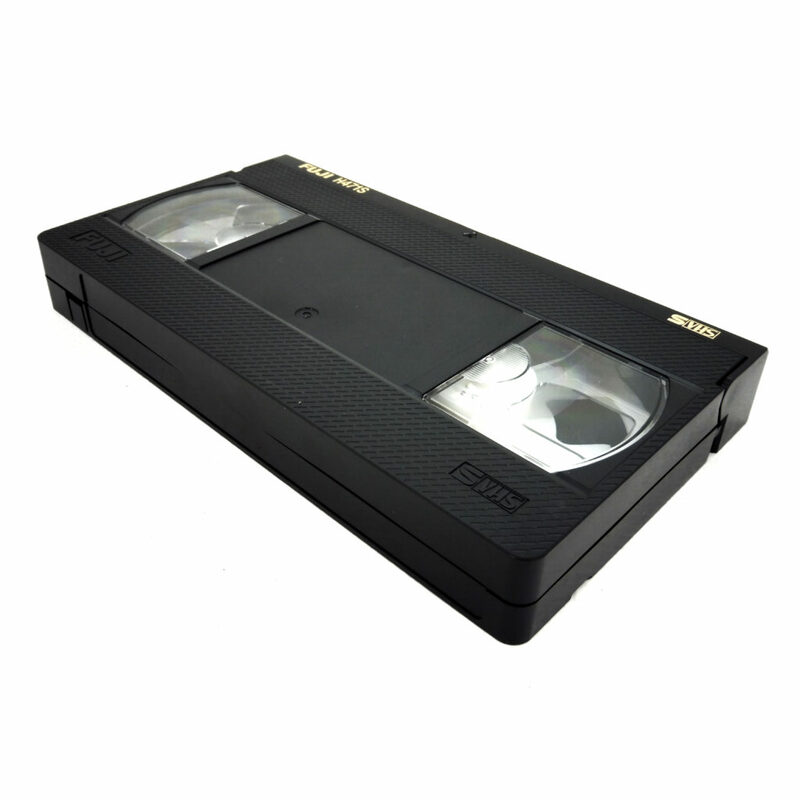 S-VHS (Super VHS) arrived in around 1987 and was the next stage in the development and improvement of the VHS Format. S-VHS recordings were nearly twice as sharp and more detailed than Standard VHS. This format did quite well, and many people took up the new S-VHS system. The largest market for this new format was with video filming semi-professional and professional video filming companies. However, this format was never regarded as a broadcast format to make TV programmes, but it was still a very good and cost-effective way to produce higher quality images and was available to the general public. All of these recording lengths of tape were able to record double the minutes shown if your SVHS player had the ability to record in LP (Long Play) Mode. If your tape is an E 180 (3 Hours) but was recorded using LP Mode, then a full tape would run for 6 hours. If we receive a tape that is over 3 hours running time we may split the transfer on to a two DVD set to provide the best quality transfer and this would be charged for accordingly. VHS-C is the Compact VHS format, introduced by Victor Company of Japan JVC in 1982 and became immediately popular because of the small size of the camera and the vast reduction in weight compared to a full-size VHS camcorder. The format is based on the same video tape used in VHS and can be played back in a standard VHS player using an adapter. The format was available in both 30-minute and 45-minute recording lengths. 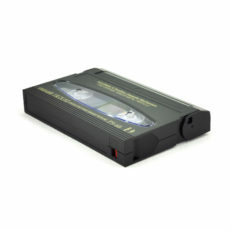 This format was introduced shortly after VHS-C and provided the same size of cassette tape as VHS-C, but the SVHS-C format provided pictures of nearly twice the detail and sharpness of the earlier VHS-C format. This format was taken up by keen amateur videographers and some semi-professional video makers. This did not last very long as we soon had the arrival of MiniDV digital video that used smaller sized tapes and produced results that were described as near-broadcast quality. Video8 was launched in 1985, into a market dominated by the VHS-C, VHS and Betamax formats. The first camera model was the Sony Handycam CCD-V8; a record-only model with no playback features, with only three focus settings and a 6x zoom. Soon after, an Auto-focus model was introduced. In terms of video quality, Video8, VHS, and Betamax offered a similar performance in their standard-play modes but, in terms of audio, Video8 generally outperformed its rivals. This format was to be a big success in the home video market as it was smaller and lighter than anything else available at the time. Eventually Video8 led to the development of even higher performance formats such as Hi8 and Digital8. The recording time of all the above would double if filmed using the LP (Long Play) function. Hi8 was developed in a similar way to VHS and S-VHS. 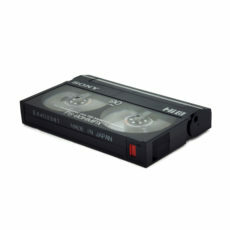 Hi8 was exactly the same size of tape as Video8, but the recording system had been improved to produce pictures and quality of detail that was almost twice as good as the earlier Video8 system. Digital8 is an obsolete consumer digital recording cassette for camcorders and based on the earlier Video8 and Hi8 systems. It was developed by Sony and introduced in 1999. This format was yet another improvement to the previous Vido8 and Hi8 formats. Digital8 was the new way of recording high quality images at very high resolution (500 lines as opposed to Video8’s 240 lines and Hi8’s 400 lines. Digital8 tapes could only be played back on a Digital8 camera or a Digital 8 video player, but most of these players would also play Video8 and Hi8 tapes as well, and you could even use these older format tapes to record Digital8 footage in these new cameras, though the recording time would be much less than was written on the case. This format was very popular with both keen amateurs and the semi-professional market and has been known to be used for news gathering for TV due to the small camera and tape size. 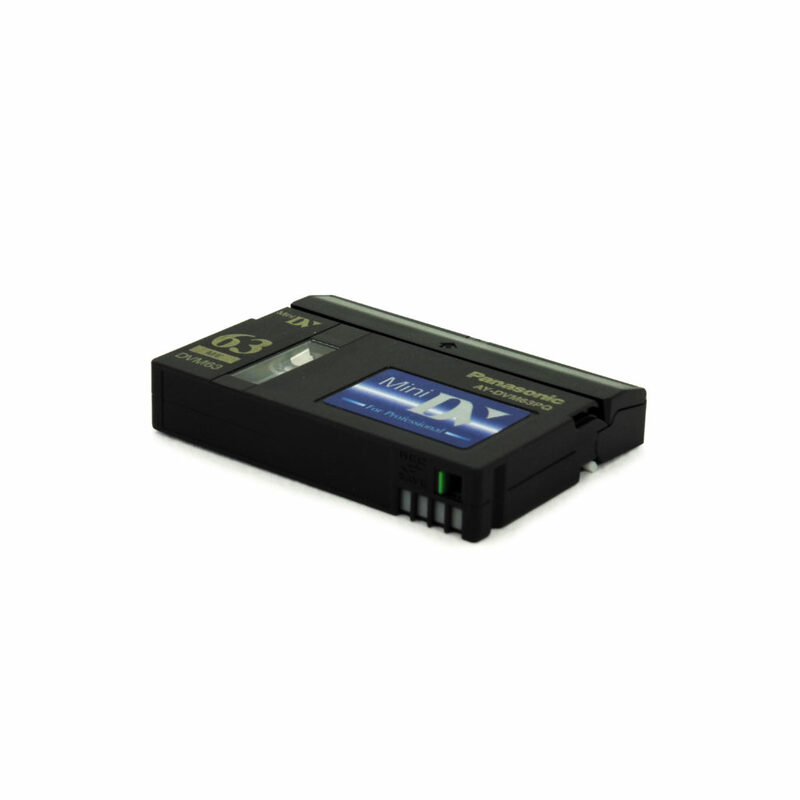 DV is a format for storing Digital Video and was launched in 1995 with the joint efforts of the leading producers of video cameras and recorders. 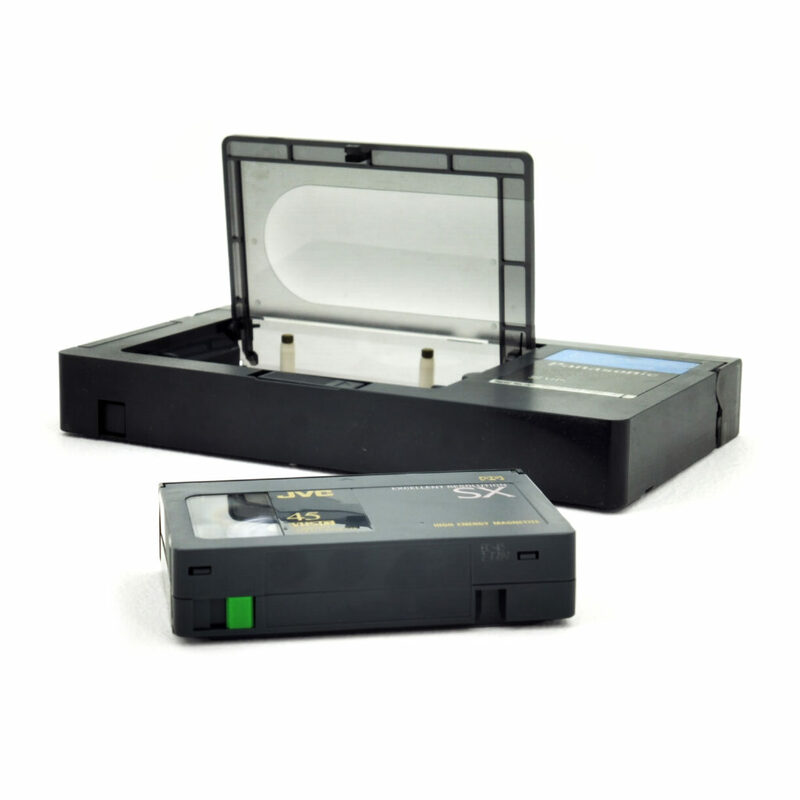 MiniDV reduced the cassette size even further, thus making the cameras even smaller. MiniDV became very popular and was initially released as a home-user format, though the high-quality results made it ideal for use in broadcast. Tape recording would soon be replaced by such formats as Mini DVD camcorders, cameras with hard drives built-in, and eventually the tiny memory cards that are used now in all sorts of cameras, phones and tablets nowadays. The recording length for MiniDV was 60 minutes (1 hour) in standard play mode, but you could get up to 90 minutes (1 hour 30 minutes) if you recorded in long play. * All our standard definition MP4 files are produced at a rate of at least 10mbs and a maximum of 14mbs (higher than DVD quality), which will get you approximately 1 hour of footage per 6GB of storage space. If you have any different requirements, please contact us. Additional video formats (including professional formats) are also available.